Ramallah (Palestinian Territories) (AFP) – A Palestinian woman died of her wounds after Israeli settlers in the occupied West Bank threw stones at the car she was travelling in, Palestinian security sources and media said Saturday. An Israeli police spokesman confirmed a car had been hit by stones but did not identify the perpetrators. He said an investigation was underway but did not give further details. Palestinian official news agency Wafa identified the passenger who died as 48-year-old mother of eight, Aisha Mohammed Rabi. She died in hospital in the northern West Bank city of Nablus from a head injury sustained in the stone-throwing incident south of the city on Friday, Wafa said, citing medical and Palestinian security sources. Her husband, who was driving the car at the time, escaped with minor injuries, the same sources said. Palestinian witnesses and security sources cited by the news agency said the stones were thrown by Israeli settlers. Stone-throwing incidents implicating Israeli settlers have risen of late, the Palestinian security sources added. The Israeli army has not commented on the attack. A wave of mainly lone-wolf Palestinian attacks against Israelis in the West Bank erupted in 2015 but had largely abated. Featured Photo: AFP / JAAFAR ASHTIYEH. 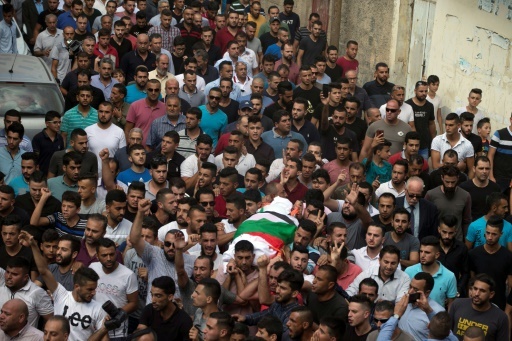 The funeral procession for Palestinian Aisha Rabi who died of her wounds on 12 October after the car she was travelling in was hit by stones.